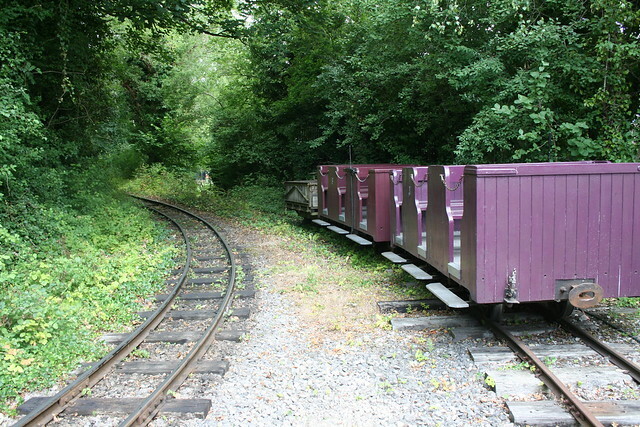 Fairlight Works | Official blog of the High Weald Light Railway (1977) Co. Ltd.
Oh hey, another year between posts. In truth this reflects the amount of modelling work actually done; with a busy home and work (both “day” job and Narrow Planet) life there hasn’t really been much time for it, although still plenty of thinking and planning – also aka procrastination. One development that should unblock things a little at home is the decision to move NP out into a dedicated workshop/office for the first time. 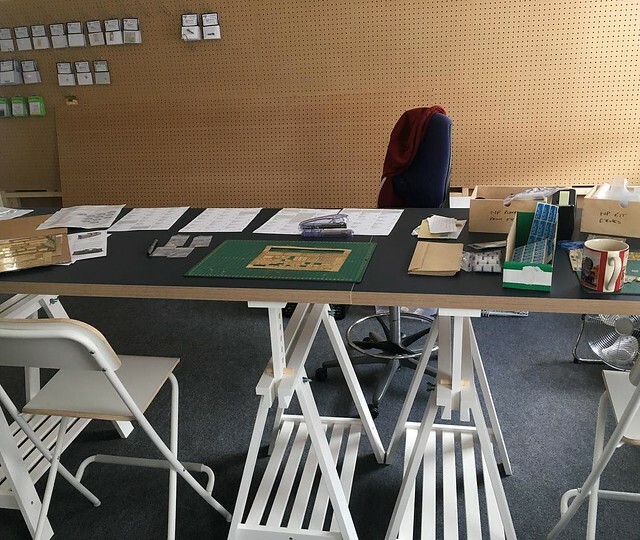 We’ve been fortunate enough to find a good space not far from home at a reasonable price, and have teamed up with another local model maker – Mulberry Works – to take it on. More on this to come. 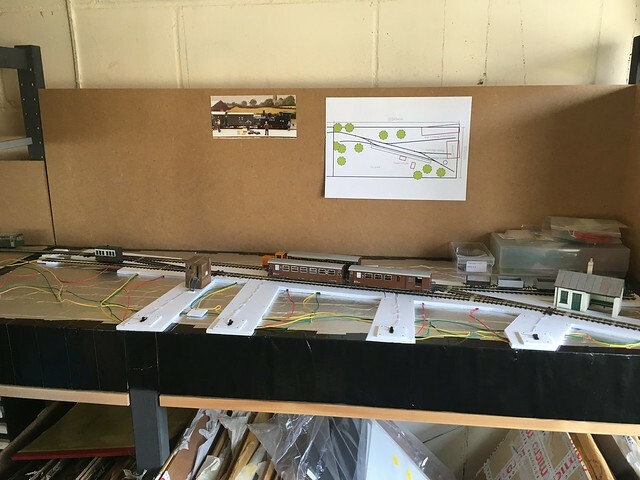 Most of the business related stuff has now vacated the garage, so with a little more breathing room maybe I’ll get back to the layout. Maybe! 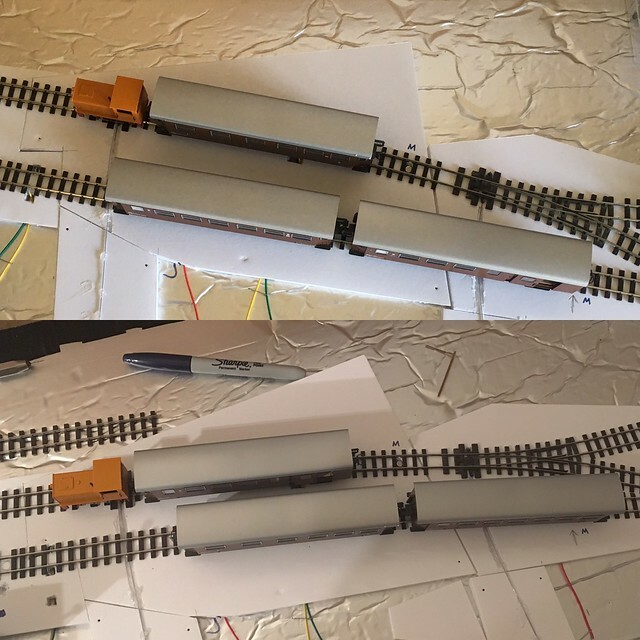 Now that the track is laid on the first stage of my new layout I need some stock for “testing”. Most of the wagons I’ve built this year already have Greenwich couplings fitted but there are also some WIP projects, acquired items and RTR that need sorting out. First up is a Parkside Dundas Hudson bogie open that I bought ready made a few years ago from Train Times in Eastbourne. 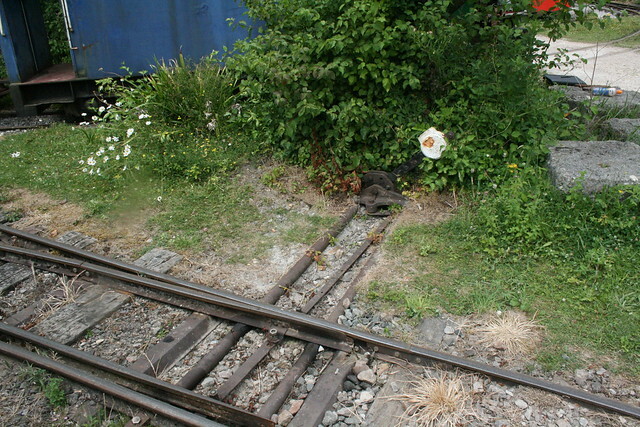 It was already Greenwiched, but closer inspection showed that they are set too low and the single loop that was present had had it’s tail cut off meaning the iron wire used for uncoupling with magnets could not be fitted. So they had to go. 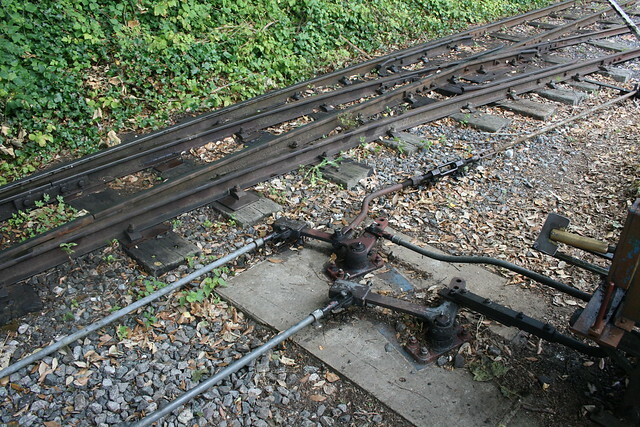 The previous couplings had been mounted in a recess on the underside of the bogies, but checking them against the height gauge that is part of the Greenwich system I found that the 6mm height recommended for the top of the coupling shank would be flush with the top of the buffer beam. 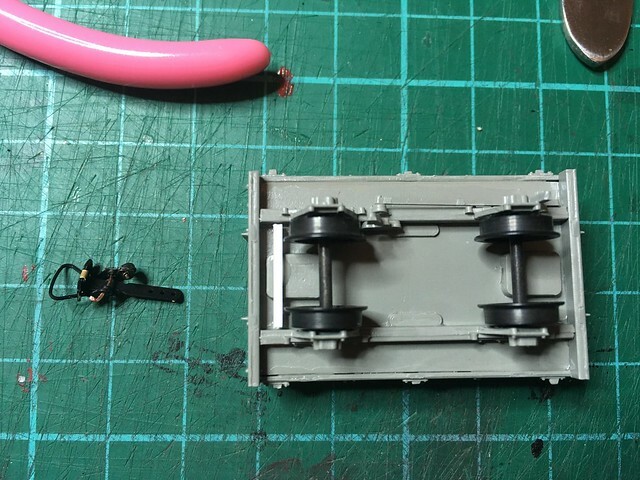 A recess was therefore needed in the top, but from the state of the bogies I decided it was easier to cut the underside recess right through and pack the hole with styrene. 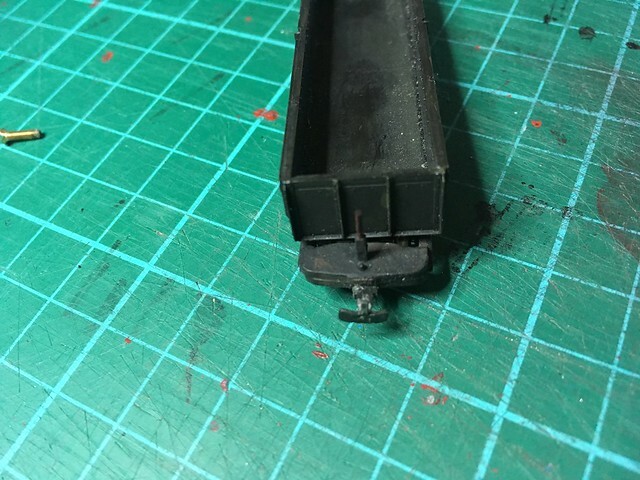 I used a couple of strips of 0.5mm, mounted on the central crossmember of the bogie, to pack a newly made coupling up to be flush with the top, and then filled the remaining gap underneath with 1mm rod. Once this filler material is painted it should be pretty invisible from normal viewing angles. Once installed back on the wagon, it’s clearly not as neat in appearance but has the advantage of actually working. I’m sure I can disguise it a little more, and the coupling at the other end will have the brake stand on top to further hide it. This also needs repair as the hand wheel is missing. 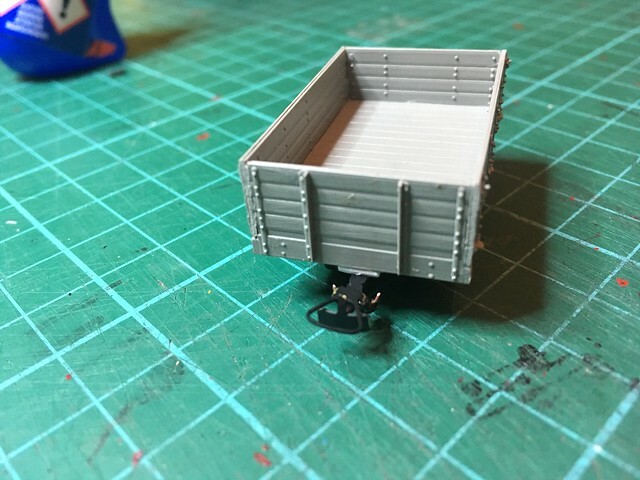 Next is a Ninelines W&L open wagon – I have a couple of these almost ready for painting. 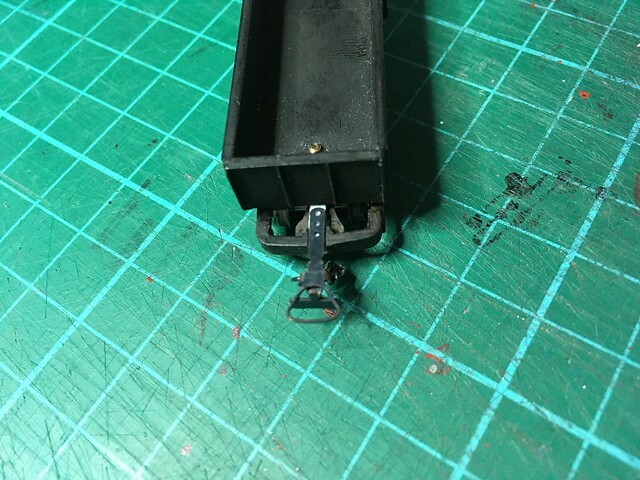 This time the bottom of the buffer beam is 7mm above the rails so the coupling needs to be packed down slightly. I glued some styrene strip to the moulded coupling mounting to form two level points to add a piece of 1mm sheet and superglued the coupling to that. 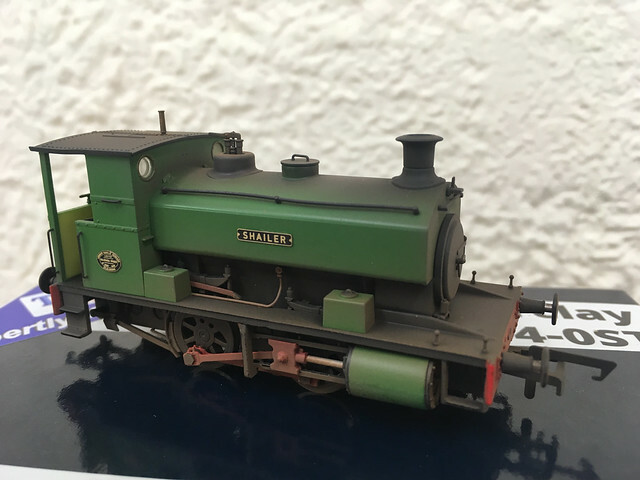 It works well and doesn’t look too out of place, although I wonder about adding a downward extension of the buffer beam to make it look more like the coupling is mounted on it rather than under it. 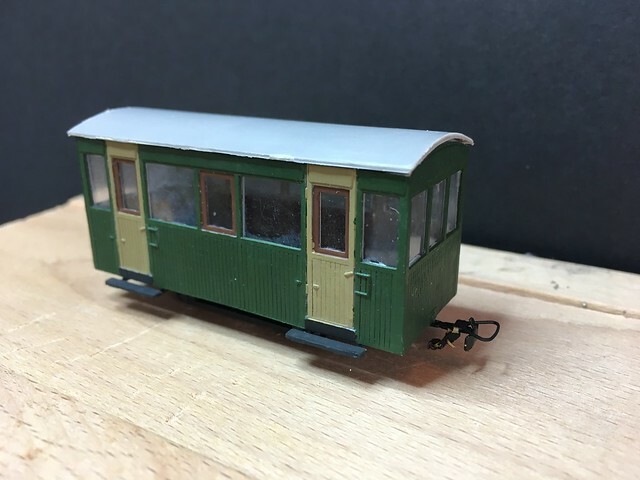 Finally for this instalment of the coupling clinic, I’ve been working on a kitbash of the Parkside Dundas ‘Bro Madog’ bogie coach – an extremely versatile 009 vehicle that has seen many conversions from many modellers over the years, most notably the “Buccabury Railcar” originated by the 009 Society Buccabury Branch group (more on my own interpretation of this idea another time…). In this case, however, I’ve shortened the coach by taking out four windows on each side and fitted the result to a slightly lengthened Meridian Bagnall wagon chassis. The result is a neat looking observation style coach which suits a freelance new build for my preserved railway layout. 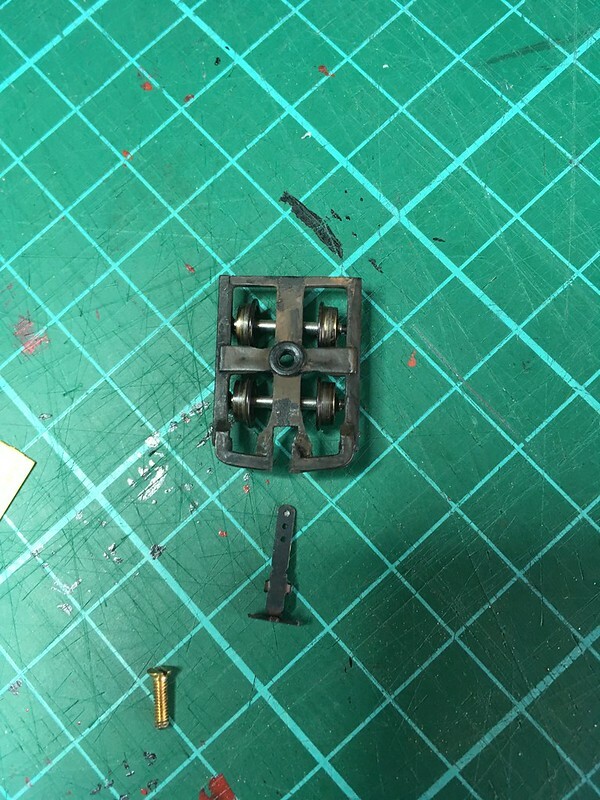 With the kitbashed chassis the lower edge of the body is at the ideal 6mm height for the couplings so fitting them has been straightforward. To make sure the overhang wasn’t going to be a problem I temporarily fitted the first coupling using blu-tack and then pushed and pulled the coach through a set track reverse curve. All was fine so I proceeded to fix them permanently. Although most of the items above still need some final painting and details such as numbering and continuous brake fittings, I do at least now have enough stock on hand to do some proper “testing” of the layout. Seen above is probably the most progress I’ve made on a model railway in more years than I care to remember. 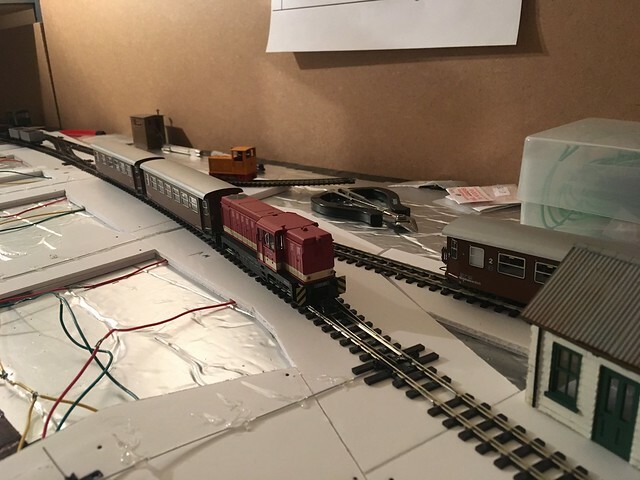 Being able to have a dedicated space at home for the layout has been a real benefit – I know many people aren’t in that situation, and I wasn’t for a long time, but the ease of leaving things one evening and picking them as they were the next has undoubtably contributed to my rate of progress. 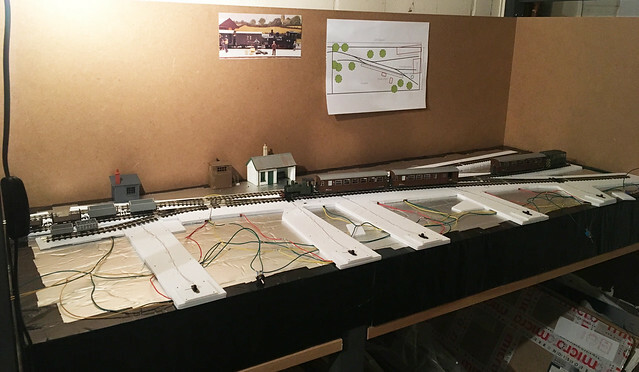 On the left hand end I’ve added an extra point versus the track plan to create an additional siding, these are intended to represent the slightly overgrown places you’ll see at any preserved railway where rolling stock waits to be restored. In fact much like this photo I took at the Amberley gala over the weekend. I’ve added a (minimal) height difference between the sidings and mainline as well to hopefully accentuate the difference when I get to ballasting. I also took a few photos of varying forms of point control, from simple levers to more involved remote operation via ground frames and point rodding. The next task before ballasting can start is working out what ought to go where. Uncharacteristically, I’ve been pushing on with track laying rather than procrastinating. 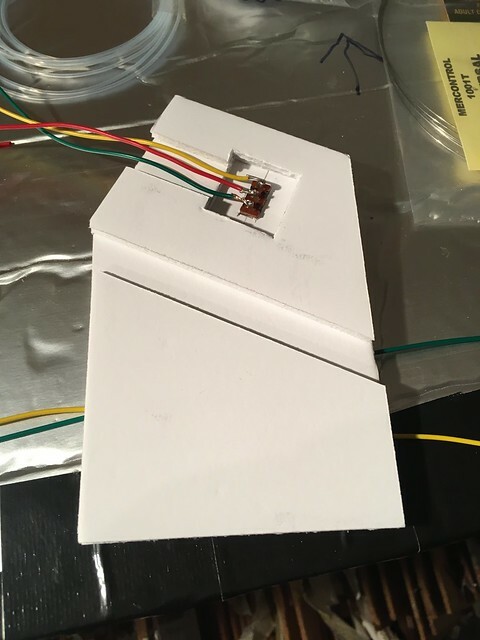 It seemed to make sense to use a sub base on top of the foil surface of the insulation board, both to allow flexibility in the layout and to compensate for the slight irregularities in it. I built this up from layers of 3mm foamboard, in sections, with extensions to support the point operating wires. 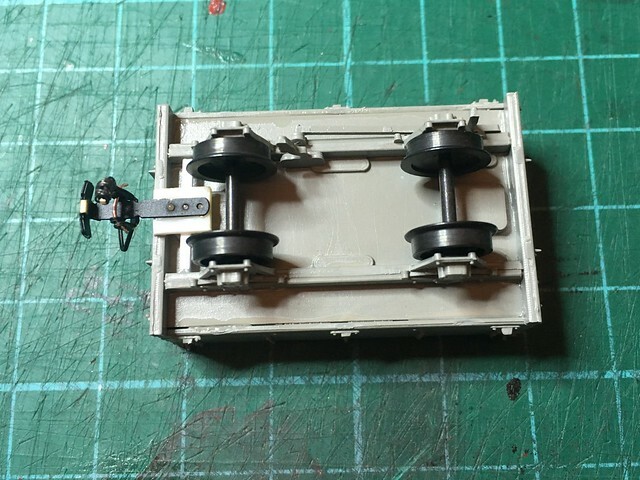 These parts were carefully cut to allow the switches to be fitted – they have a suitable throw to operate these 009 points as well as switch the frog polarity – and with channels for the wiring to feed through. 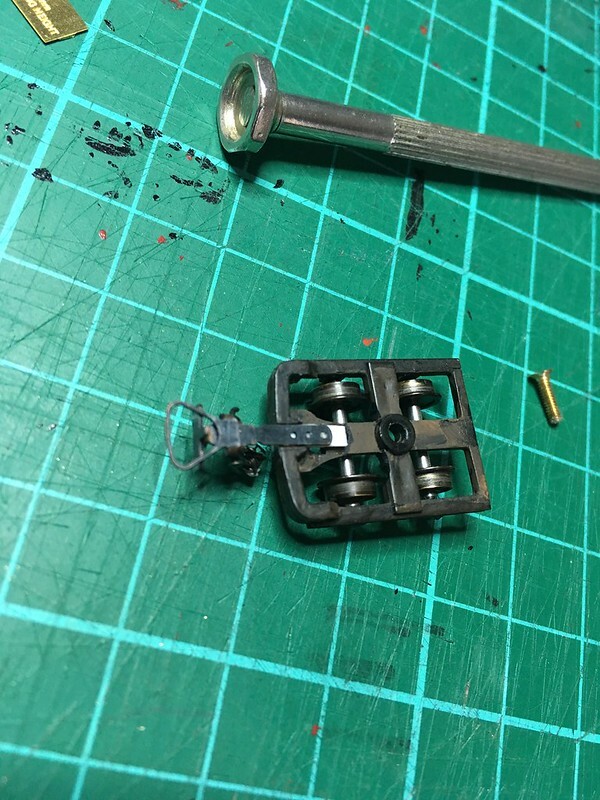 With the advantage of using simple tools – craft knife, wire cutters, glue gun and solder iron – this came together pretty quickly, taking an hour or two each evening over a week. 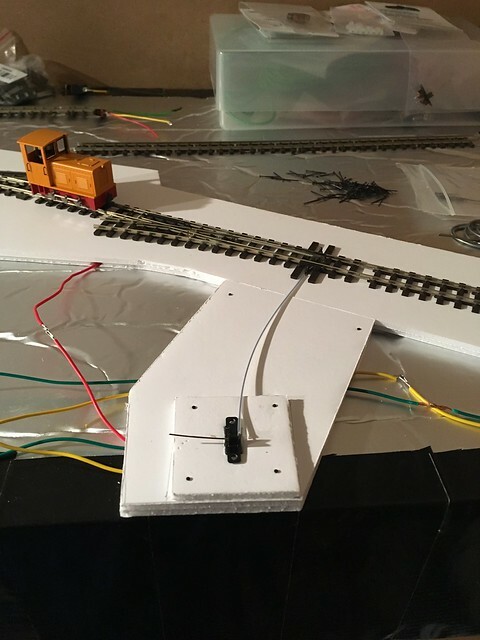 As things progressed, though, I found that the track alignment wasn’t quite as accurate as it could have been and the tracks of the loop tended to widen throughout it’s length. The result was that a fairly elongated crossover was required to bring them back together, and the lead in track from the fiddle yard ended up shorter than I wanted. At this stage it wasn’t too late to make changes, and after considering things for a couple of days decided to adjust it. By bringing the track spacing down to 40mm (it was previously up to 60mm at it’s widest) I regained a few centimetres of lead in and found that the whole station site was on a subtle curve – not quite as planned but nevertheless a pleasing result. The final positioning of the sidings, plus their isolation sections and uncoupling magnets, still needs to be done but this feels like a good step forward. Having a working layout is great!